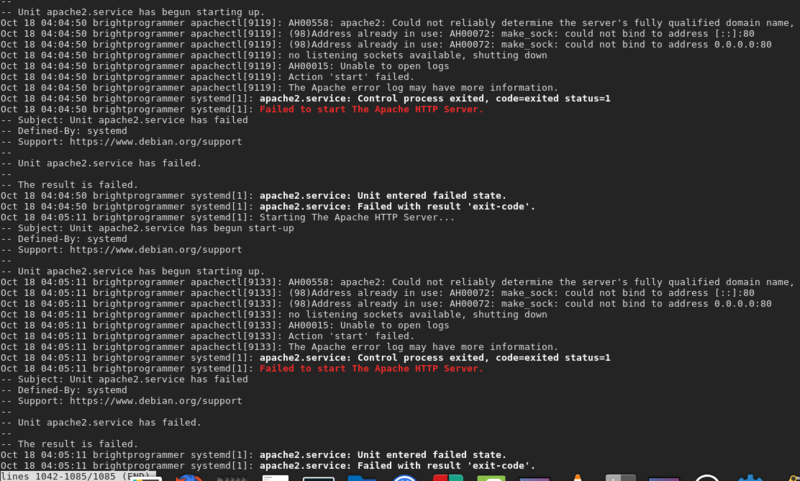 service apache2 restart Job for apache2.service failed because the control process exited with error code. See "systemctl status apache2.service" and "journalctl -xe" for details. I thought that there might be some errors while package installation and tried sudo apt purge apache2 and then sudo apt install apache2 but that didn't solved the problem. This means that some service is running on port 80 already. Now, there can be two situations that I can think of. Apache has already started and you are trying to start it again. You can try with 'restart'. I guess you already did that. Another service is possibly using port 80.
sudo netstat -ntlp |grep ":80"
Depending on the result, you will have to take corrective measure. Not the answer you're looking for? Browse other questions tagged server apache2 webserver error or ask your own question.